@Bali | Get Your Grub On! We discovered this place during our last visit to Bali out of pure time pressure. We used to go to ‘Bebek Bengil’ in Ubud but for our duck fix but since we were staying in the Seminyak area we didn’t want to make the long drive out there and so ended up here on our last evening on the island. 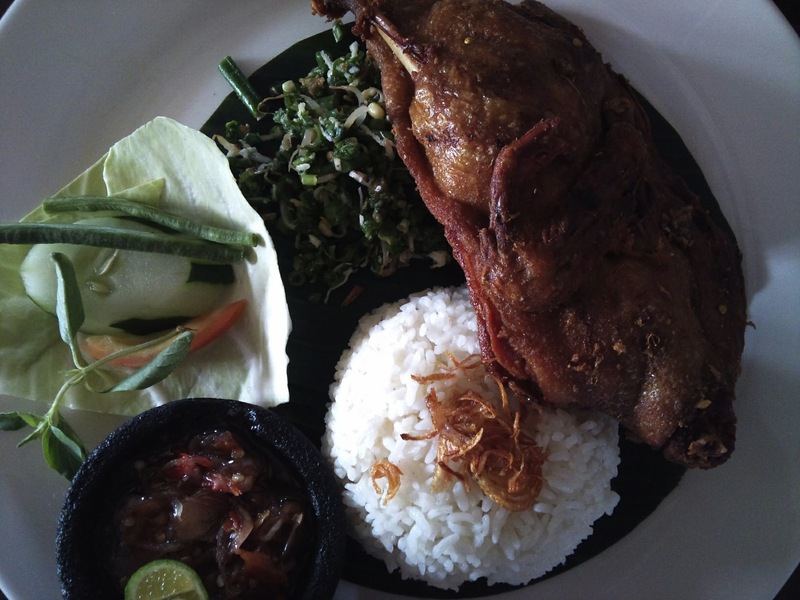 I ordered their signature special package no.3, the ‘Bebek Goreng‘. 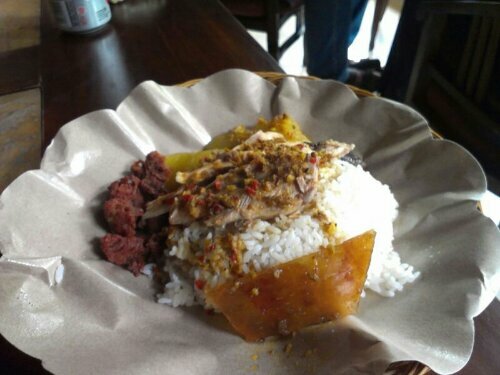 Part of the set were also ‘Nasi Putih‘ (white rice), ‘Urap Urap‘ (mixed veggies) and sambal, a real stinger. Additionally I ordered their special ‘Sambal Bledek‘. The duck here was absolutely fabulous, fried so crispy that I didn’t have any problems chewing the thin bones like crackling skin but still moist on the inside with a good and solid duck flavor to it. Veggies and rice were ok but nothing extraordinary but the sambals, oh the sambals. My body always hates me for it but I just can’t go around any sort of chili, sambal and other spicy stuff. The special sambal was supposed to be the burner but I didn’t find it spicy at all. It tasted mainly like anchovies which was interesting but didn’t work for me together with the duck so I attended to their standard sambal instead. This one consisted of red and green bird chilis, thinly chopped onions, all mashed up in oil and drizzled with lemon juice. It was great and hit the spot just right. It didn’t take long for me to breath with an open mouth and feeling sweat drops running down my head. All entirely positive signs of course. I enjoyed my duck and the place very much. It’s a down to earth and relaxed little restaurant without that fancy setup many Seminyak places have, yet not quite a warung. That’s why they call it Butterfish! After pre-dinner drinks at the W Hotel in Seminyak tonight we walked via the beach over to ‘Potato Head’ to get our grub on. The setting was stunning facing the sea in a half circle separated into beach club and restaurant, covered with window shutters from the in- and outside. 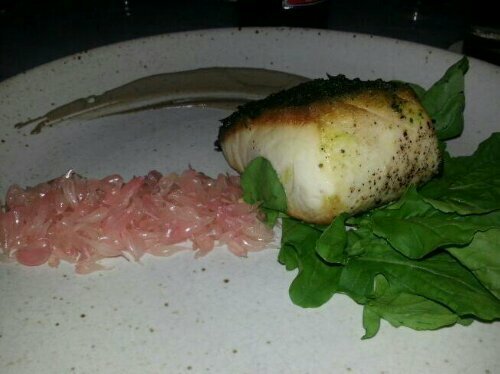 I ordered the ‘Pistacchio Crusted Butterfish‘ with arugula, pomelo and a truffle infused vinaigrette. I was surprised that for a place like this the prices for food were very reasonable and for the level of quality even more. The butterfish, according to it’s name, was super moist and crazy sweet similar to crab meat. The texture was very firm and it fell into big chunks when getting at it with the fish knife. The crust added a nice crispness to the fish but I couldn’t make out that it was pistacchio no matter how hard I tried. The popping pomelo pearls and the bitterness of the arugula worked great with the dish but my favorite combination was just the fish together with the truffle vinaigrette. Simply delicious. The friendliness of our waiter could have been more welcoming as we arrived 20 minutes before last order and felt like a bit of a bother but put that aside and considering the taste and quality of the food and the fantastic location I’ll be returning to this place when being back on the Islands of the Gods. I followed my friends to Bali this week and yesterday we were driving around the island and ended up in Ubud for a late lunch. One of my Indonesian friends really wanted to try out a popular restaurant for ‘Suckling Pig‘, ‘Warung Babi Guling’. Their main branch next to Ubud Palace was already packed so we continued walking a bit further to the ‘Ibu Oka 3’ branch. It was kinda hidden but there was enough signage and people directing us to find it easily and I must say the atmosphere here was even nicer as it was more quiet and overlooking a bit of jungle. We ordered the ‘Spesial‘ which is a collection of pork meat, crackling (skin), blood sausage, fried pork, potatos and rice. The pork meat was lovely tender and juicy and marinated nicely with Indonesian spices. All greasy fat was removed from the skin and it made awesome cracking sounds and tasted great. Even that I am not a huge fan of blood sausage and black pudding I really liked this one all over, consistency and the well flavored taste. I just left the casing as it didn’t look very appealing and seemed quite tough. The fried meat didn’t taste like much besides the spicy batter and was rather dry. The vegetables were simple potatoes that were slightly spicy but too soft for me but the rice again fitted nicely with its coconut flavor and and tasted delicious in combination with the meats. It all got even better when we asked for their sambal which was chopped and marinated bird chilis and brought fire into the game. I really liked the food here and for only 30,000 IDR for the ‘Spesial‘ set I now have a new attractive and tasty option when passing through Ubud in the future.